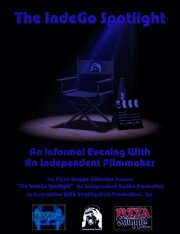 IndeGo Spotlight, a monthly showcase for local film makers. Each month will feature a local director showing their work, doing a Q+A with a host and the audience. An excellent opportunity to see what new films are being made in the local area. The first show will feature Daniel B. Iske the director and producer of the critically acclaimed web series "The Dead Hour"
Who will be discussing his inspirations for his work and approach to the creative process. For more information on the IndeGo Spotlight check out the page at. The February Spoken Word Show! Yes we're doing it again. Because to be honest no one has tried to stop us yet. This months spoken word show will be on february 20th at the Pizza Shoppe Collective (6056 Maple Street) at 7 O'clock. The show is called the "February Spoken word Free For All" It will feature a number of the artists we have had previously including. This show will feature the debuts of several new spoken word artists and we look forward to seeing what madness they may spread. The theme of this months show is "Romance" and our charity will be the Domestic Violence Crisis Center. As usual there is no cover but if you can bring some extra money to donate to the good folks at the center that would be excellent.